Penang saw its worst floods yesterday after an 18-hour storm swept through the Malaysian state and brought it to a standstill. Murky brown waters inundated homes in the early hours of yesterday, forcing residents out of bed as they scrambled to move their belongings to higher ground. For many, however, damage and loss were unavoidable as water levels reached the rooftops of houses. Meanwhile, submerged roads in the capital George Town, a Unesco World Heritage site, made traffic impassable. Many cars were abandoned and left to drift in the rushing torrent. The overnight downpour - equivalent to 11/2 months of rain in the state - also resulted in dozens of landslides and fallen trees, which impeded travel and further hampered aid efforts. 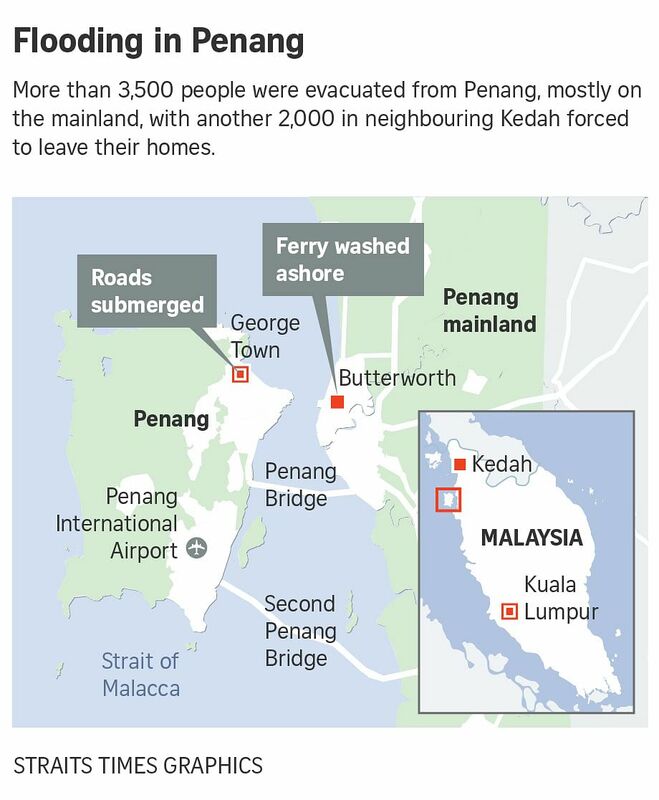 As of last night, the floods claimed seven lives and caused thousands of people to be evacuated from both Penang island and its mainland territory in Peninsular Malaysia. The extent of the disaster was made evident when Penang Chief Minister Lim Guan Eng said he had called for federal help "to save Penang". Malaysia's military promptly stepped in to help with relief efforts, with boots on the ground in Penang by 8.30am yesterday.